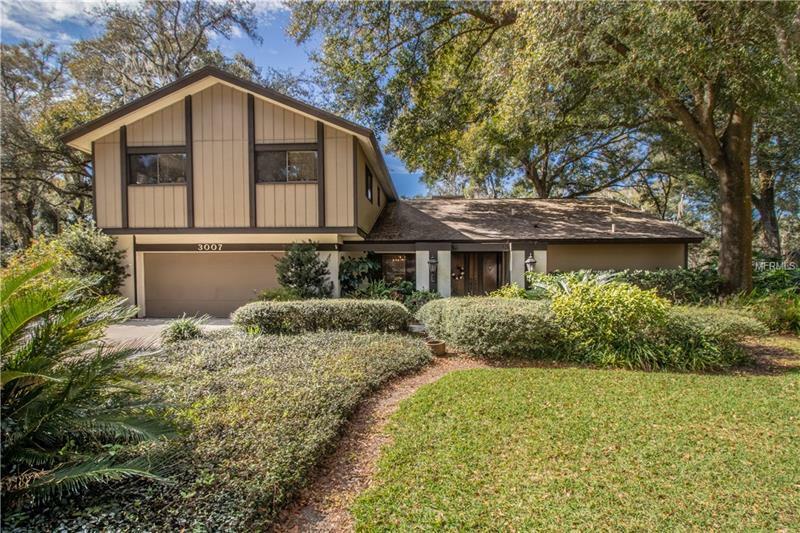 Sitting on a large, corner lot with mature landscaping and majestic oaks, this 4 Bed, 3 1/2 Bath home is located in the established Valrico neighborhood of Lithia Oaks. Walk through the front door and into the open living area with wood floors, vaulted ceilings and views of the pool area. The Dining and Great Rooms have wide-plank wood floors, wood burning fireplace and sliders to the outdoors. All this flows into the updated kitchen with pantry, breakfast bar, a pass-through to the lanai from the kitchen which is great for entertaining, and overlooks a flex space with triple sliders to the lanai. The Master Bedroom is conveniently located downstairs, also with sliders to the lanai, a walk-in closet and the extra feature of a dressing area separate from the updated Master Bath. The first floor also has the convenience of a half-bath and amazing stairs to the second floor with wood floors to welcome you on the landing. Upstairs is a large Bonus Room along with three secondary bedrooms and two updated baths. One of the many highlights of this home is the property that includes almost 1/2 acre with mature landscaping for privacy, a large covered lanai with pavers and pool. You will appreciate the immaculate care the current homeowner has provided the home over the years and we welcome the opportunity to show it to you in person.